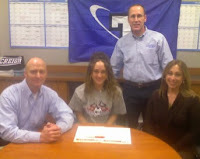 Papillion Lavista South Soccer Player Signs with the CSM Flames! Ladies and gentleman, did you know that Ramsey Miller, a defender/midfielder signed her letter of intent with the College of Saint Mary Soccer team today? Ramsey plays soccer for Papillion Lavista South High School here in Omaha. She plays her club soccer with the Gretna Remix team. Ramsey's Remix team helped the Flames train in the fall season by coming and practicing with us in August. Ramsey is excited to begin the occupational therapy program at CSM. A number of the soccer players at CSM are in the OT program. It is a great major where you can get both your bachelor's and your master's degree in only 5 years. Ya! Ramsey will be a wonderful addition to the recruiting class of 2009 and the coaching staff looks forward to training her. Our recruiting class numbers a strong 4 right now and we are planning an signing a few more. Stay tuned to this space for more info. Ramsey is also known to be a pretty good golfer as well as a good soccer player. Maybe she can take us all out to the course and show us her talents on the links? What is going on? Well, the CSM soccer players are training and playing. The training goes on every weekday except Wednesday at 6 AM at the Xplosive Edge training center on 147th & Giles. The playing occurs on most Sunday evenings at the same place as the Flames participate in the women's open soccer league. The training is going well. Most of the players are gaining muscle and explosiveness. I am looking forward to seeing how much the girls have improved when they do their testing out on March 6th. When we first started training this year in January, all the players were tested on their vertical leap, pro agility drill, 10 and 40 yards dashes, et cetera. March 6th, we test them again to see if anyone got stronger and faster. The playing is also going well in the women's open soccer league. The Flames are currently undefeated after 2 games but face an experienced and talented team this Sunday evening. We look forward to the challenge. Last Sunday we had a potluck soccer banquet. We ate chicken, salads and great deserts. The evening was topped off with an awards presentation. The players won awards ranging from the "MVP" award to the "Biggest Crush on Zach" award. (Zach is one of our X-Edge trainers.) A good time was had by all!